New Delhi: India moved into the top half of the Global Innovation Index (GII) in 2017 by climbing six spots to 60 in a survey of innovative capacity among 127 countries. The country also maintained the top spot in the Central and South Asia regions, according to the rankings released by Cornell University, INSEAD and the World Intellectual Property Organization (WIPO) released on Thursday. Switzerland, Sweden, the Netherlands, the US and the UK lead the 2017 GII rankings. China further improved its ranking to 22 from 25 last year. India improved its rankings in five pillars such as Institutions (up 4 spots to 92nd), Infrastructure (up 14 spots to 73rd), Business sophistication (up 2 spots to 55th), Knowledge and technology outputs (up 5 spots to 38th), and Creative outputs (up 9 spots 85th). By contrast, in Human capital and research (64th) and Market sophistication (39th) India lost one and six positions respectively. At the sub-pillar level, India enjoys its largest gains in areas such as Knowledge absorption, Knowledge impact, and Intangible assets. Despite education remaining a weak sub-pillar, India has improved there, advancing four positions to 114th rank because of better relative government expenditure per student. At the indicator level, India improves in a number of areas this year, including government’s online services, e-participation, logistics performance, gross capital formation, high-tech imports, and industrial designs. 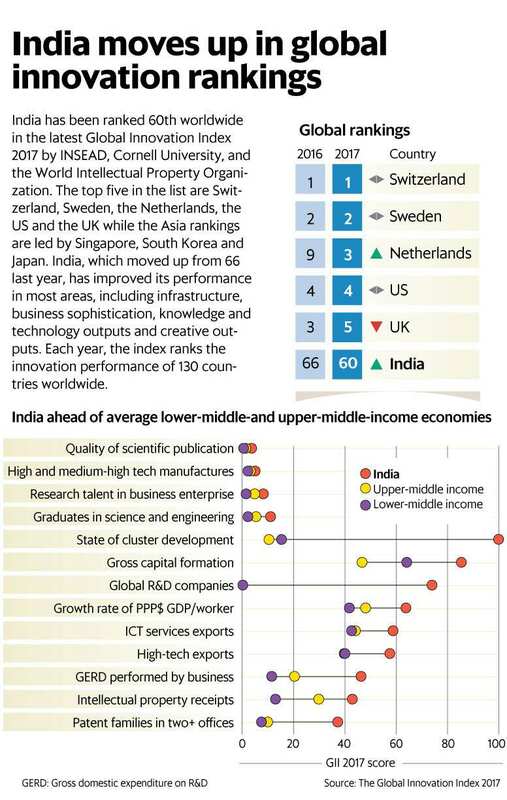 Also it gained six-positions in global R&D companies, where India ranks 14th, considerably better than the respective groups of lower- and upper-middle-income economies on average. The report said India’s current and imminent development, and its contribution to the region and the global innovation landscape, is vital these days with the country consistently outperforming on innovation relative to its GDP per capita. “It is to be hoped that India will continue on this trajectory, with innovation investments leading to more and more dynamic R&D-intensive firms that are active in patenting, high-technology production, and exports. If India then increasingly connects its innovation system to the innovative countries in the East, as well as to standing innovation powerhouses in the West, it will make a true difference in Asia’s regional role in innovation, and to global innovation more generally," it said. A task force on innovation set up by the Department of Industrial Policy and Promotion last year recommended a change in methodology in GII. In the political stability pillar where India ranks 113, the task force said with a vibrant and stable democracy, the largest in the world, ever since Independence 70 years ago, India deserves much better. “The ranking needs to be based on a quantifiable methodology approach, rather than the present composite indicators approach," it said. On the low ranking in business environment, the task force said to have comparison of costs across cities, the calculations of such costs should be in terms of purchasing power parity (PPP) terms, instead of as the percentage of per capita income of the country.